If you like retro style dress shoes that have 1920s written all over them, these Black Giorgio Brutini Biscuit Toe Dress Shoes are just what you need to get your Prohibition Speakeasy style in motion. 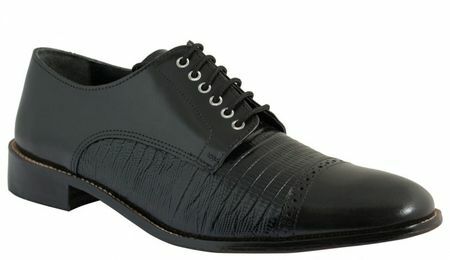 These Black 6 eyelet lace up style Biscuit toe shoes are made of Smooth leather combined with Lizard Print Leather in a lace up cap-toe style that mimics the Stacy Adams Madison Shoe with a full leather sole. The shoe comes in a D width. Since these Old School Style Biscuit Toe Shoes are Made by Giorgio Brutini, You know that they feel right on Your feet the first time and every time. If you like modern fit suits that you see celebrities like David Beckham and Justin Timberlake wearing, you need to get yourself some Zoot Suits in all kinds of colors here.